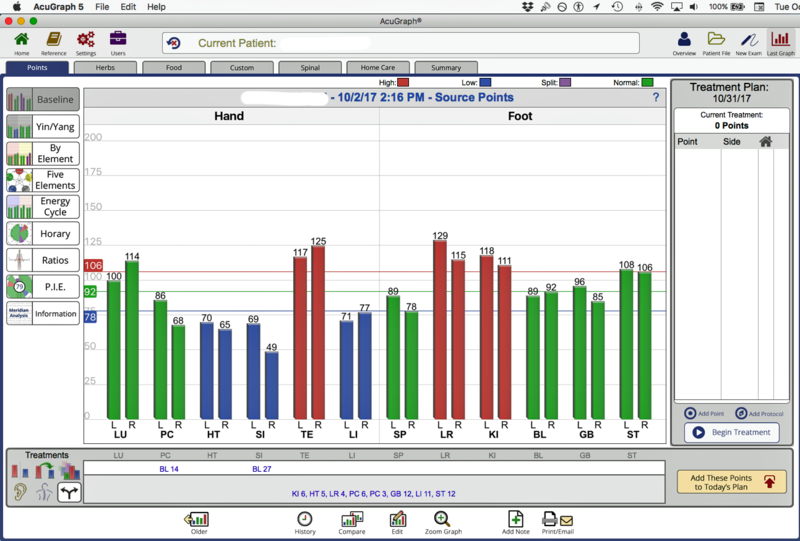 Over the last number of years, I have been using AcuGraph to guide me in a protocol I have come to call the 3-Level Acupuncture Balance. I’d like to present a series of postings describing what this balance is, why I think it offers a deep and profound treatment, and the history of its development. In this posting, I want to jump right to the mechanics of how to perform the treatment, so that you can put it into practice right away. The 3-Level Balance is the culmination of work started in the 1970s with Yoshio Manaka, developed through his followers at the Topological Society in Japan, and brought to fruition through Miki Shima’s Somatic-Auricular Therapy (SAT) in the 1990s. 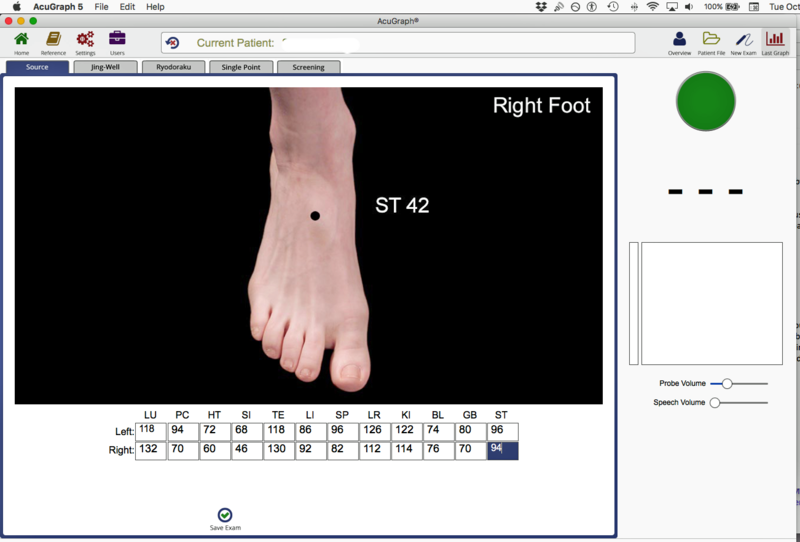 Thanks to Adrian Larsen, the diagnostic aspect is now incorporated in the AcuGraph menus, making this very interesting acupuncture approach available to all of the users of the AcuGraph. The 3-Levels are the primary channels, the 8 extraordinary channels, and the divergent channels. The primary channels are responsible for moving and regulating qi and blood; the 8 extraordinary channels are responsible for balancing and treating the musculoskeletal body; and the divergent channels balance and regulate the internal zang-fu organs. The basic treatment for these three systems requires only 8 needles, making for a very efficient yet deep approach for promoting self-healing, boosting vitality and enhancing immune response. It serves as a foundation root treatment that can then be followed with branch treatments using ear, TCM, Tung/Tan symmetry balance, etc. There are many subtleties to performing the treatment, which I hope to cover in future postings. But today I want to show you how to diagnose and give the basic treatment. This regulates the eight extraordinary channels and the divergent channels, which in turn will take care of most primary channel imbalances. Honest! In a future posting we will show how to enhance and balance the primary channels as part of the overall 3-Level Treatment. The treatment involves Japanese needling: thin needles with relatively superficial insertion. It also involves ion-pumping cords (IPC), which move electrons in one direction only. We use them to move excess energy of one channel to a channel with deficient energy. IPC were developed by Yoshio Manaka, and is a very efficient way to balance meridians. We start by taking the basic reading with the AcuGraph, using the yuan-source point diagnosis. It’s important that the readings are done carefully and accurately, and this in itself is an art. For myself, I expect the right and left readings for each meridian to be with 12 points of each other. If not, I will re-measure both points again. Often, careful attention to point location and pressure will bring those two readings closer together. About 20% of the time, they are just different, but at least now we know for sure. 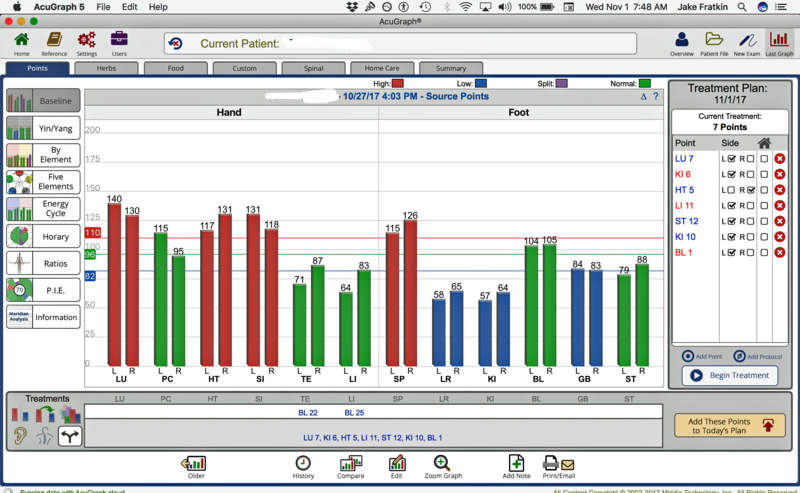 Once the reading is complete, the basic bar graph will show for the patient. In the lower left side of the menu are “Treatments”, which display 6 different icons. The top three show red-blue bar drawings, while the bottom three show, in order, an ear, a body with spine, and finally two arrows diverging from a single bar. It’s this last icon on the far right, the Divergent treatment that we want to press. Now the points for the treatment show on the bottom center of the graph. Next, go to the bottom right side of the menu, and press “Add These Points to Today’s Plan”. The points will list above in the Treatment Plan box, on the right side of the page. We now have two groups of points, the upper half and the bottom half. Let’s talk about the upper half first. By upper half, this is typically the upper 4 points listed, but occasionally it is only the upper 3 points. These are the points that will balance the Eight Extraordinary Channels. The points are listed as either blue or red, and only one side is checked. They are in order: the first two points are one pair, the second two points (typically) are the second pair. For the 8 Extra treatment, paired points can be unilateral, or cross lateral, so pay attention to which side will be treated. For the Divergent treatment, the bottom group of 4 points, the pairs are always unilateral, that is, paired for the same side. Sometimes both pairs are on the same side, sometimes one pair is on one side and the other pair is on the other side. What is a Divergent treatment? Before the Japanese developed a Divergent channel protocol in the 1970s, the channels were discussed in theoretical terms only, going back to Chinese classical texts. But the basics were understood. Divergent channels dive at the he-sea points and go through the organs, surfacing again on head or neck points. Each yin and yang pair of a specific element/phase, such as LU-LI, SP-ST, etc. has their divergent channel meet and help each other. The channels were seen as an internal way to regulate the zang-fu organs, and more importantly, to protect the organs from exogenous pathogenic factors. More on this in a future posting! Going back to our listing of 7 or 8 points in our “Treatment Plan”, how do we know if we are using 4 or 3 points for the 8 Extra treatment? The bottom group of points, used for the Divergent Channel balance, always contains 4 points, so count up. The total (once you removed the very bottom Bladder-shu points) will be either 8 or 7 points. If there are 7 altogether, the top group, for the 8 Extra, will default to 3 points only. In those cases, the two pairs share one common point, that is, a point is used twice, for two different pairs. Confused? I hope not! So to review: 1) We take the reading at the yuan-source points. 2) We choose the Divergent icon (bottom left) and add to Treatment plan (bottom right). 3) We remove the bottom 4 bladder-shu points. I like to graph out a chart so I know exactly how I will be placing my needles and cords, with the 8 extra points listed above and the Divergent points listed below. I put this with my needle tray in order to guide my treatment. Now I am ready to treat. Have the patient lay face up on a table. I usually stand to their right side. I want to do the 8 Extra treatment first, with needle insertion and attachment of IPC/cords. When that is complete, I will go on to do the Divergent treatment. 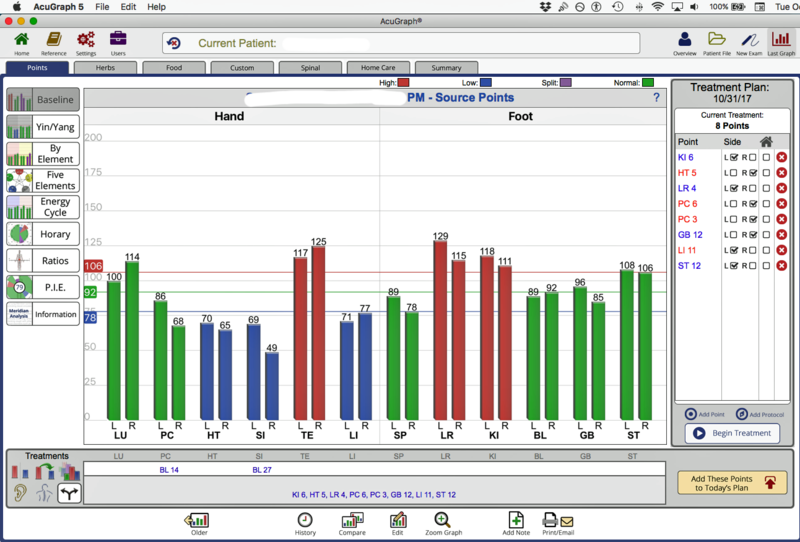 For the patient illustrated above, the upper 4 points are the 8 Extra treatment, and they are listed as pairs. For this patient, the two pairs used are KI 6 – HT 5, and LV 4 – PC 6. We see that KI 6 is in blue, left side; HT 5 is red, right side. Then LV 4 is blue, left side, and PC 6 is red, right side. Some of you may be thinking, “Hey wait a minute. KI 6 – HT 5 an 8 Extra pair!? And LV 4 – PC 6! What?” True, these are not traditional 8 Extra channel pairs. In a future posting on the history of our protocol, you will see how (and why) Miki Shima and others expanded the 4 traditional pairs to include all 12 channels, with specific pairings. For the moment, trust the AcuGraph Divergent menu suggestions, just keep them coupled as they are listed, two at a time. I use a .16 x 30 mm needle (Japanese #1, Chinese 40) for most of the 3-level balancing points. These are inserted with a pipette-tube, relatively superficially. We want them shallow, but deep enough that the ion-pumping cord (IPC) won’t pull the needle out. I am usually happy with a 2-5mm insertion. If the IPC tugs on the needle too much, you can hold in place with paper tape. I place the two leg points first, then the two arm points. (8 Extra pairs always combine a leg point with an arm point.) These may be unilateral (same side of the body), or crossing the body – one leg and the opposite arm. Be careful to attach the cords to the correct points of the pair, and be careful that you use the correct polarity! IPC cords have a black clip and a red clip. In this case, attach the black clip to KI 6, listed as blue, negative, and the red clip attached to its paired red point, HT 5 positive. LR 4 will get the black clip, and PC 6 will get the red clip. Because the ion-pumping transfer is so powerful, other traditional parameters for tonification and sedation, such as direction and coordination with respiration, are less important. Ion-pumping cords send electrons in one direction. In our protocol, we want to send excess energy to the place of deficient energy. The cords send energy from black to red. So, if we see that KI 6 is blue, that means we need to sedate that point, and send it to HT 5, which is red. With the AcuGraph Divergent menu, our colors coordinate well. The black clip goes to the blue point, and the red clip goes to the red point. As we mentioned above, for the 8 Extra treatment, there will be cases where only 3 points are listed at the top. Here, one point will be used for two separate pairings. 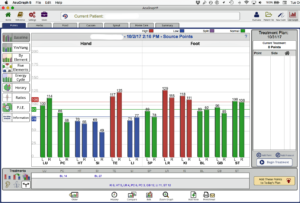 On AcuGraph’s “Treatment Plan”, one point will show one polarity/color, while 2 points will show the other polarity/color. In the graph shown here, we see there is a total of 7 points in the “Treatment Plan”. (I have removed the last 4 Bladder-shu points.) 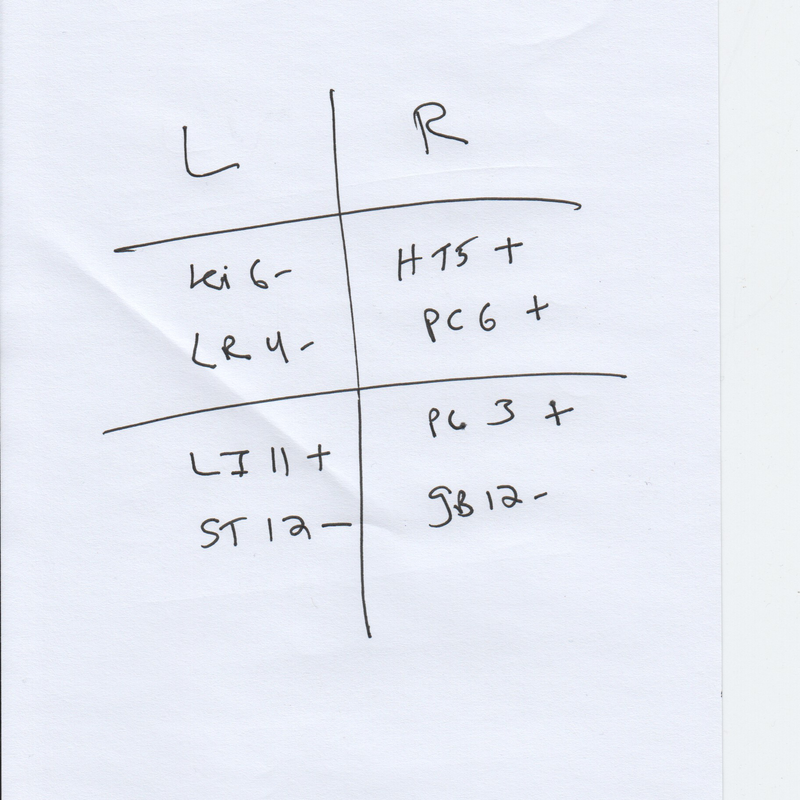 The bottom four are always the points recommended for the Divergent treatment, in this case LI 11 – ST 12 and KI 10 – BL 1. The top three show LU 7 (blue), KI 6 (red), and HT 5 (blue). Here, the point with one color will be used twice (KI 6), with two separate IPC attached to this one point, both using the red clip. The cords will go out to the two points with the same color (LU 7 and HT 5), which are blue on the graph and will use the black clip. This allows the excess of the Lung channel as well as the excess of the Heart channel to feed into the deficiency of the Kidney channel. Once the 3 or 4 Eight Extra points are attached with ion-pumping cords, we go on to the Divergent treatment. The Divergent treatment balance the internal zang-fu, based on their 5-Element partnership. In our example, the right side treatment says PC3 and GB12. This will balance PC and TE. On the graph, you can see that TE is excess, while right side PC is low. The Divergent treatment uses head/neck meeting points where the excess channel can meet with its deficient partner. On the left side, we have LI 11 and ST 12. Here, Lung energy will feed into and support the Large Intestine, meeting at ST 12, its head/neck Divergent meeting point. The Divergent balance is a deep and clever way to harmonize the internal organs. More in a future posting! So, in our case above, we treat PC 3 and GB 12 (right side) using an ion-pumping cord, and LI 11 and ST 12 (left side) using an IPC. Black clip to the point we are sedating (blue color on menu), and red clip to the point we are tonifying (red color on menu). Remember, Divergent pairs are always unilateral, performed on the same side. Manaka felt that a 10 minutes with an ion-pumping cord was sufficient to achieve the balance between two meridians (or two points on the same meridian). In our treatments, when the last cord in attached, the treatment only needs another 10 minutes, but can stay in longer when doing a branch treatment. Once the four pairs are in place, (two for 8 Extra, 2 for Divergent) you can do branch treatments on the body or ear. In Miki Shima’s protocol, the branch is best done using auriculotherapy, and of course Kimberley has been training you in this all along. Exciting, no? I would love for you to start doing these treatments right away! Make sure to buy 2 sets of ion-pumping cords (four cords) in advance. 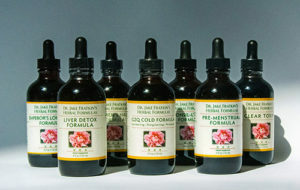 They are available from various sources, including Lhasa OMS, Golden Needle, etc. Start doing the treatments so that you can get used to its practical application. In our future blogs, I will explain in more detail why this is such a profound treatment for deep balancing, as well as its fascinating history and devlopment. We are working on three levels: The qi and blood of the meridians; the musculoskeletal structure; and the internal zang-fu organs – all at the same time! With eight needles! Don’t be surprised to find your patients expressing deep relaxation, and watch as their complaints gradually disappear with treatments.